I am not back from WikiConference USA 2014, but I am settled in here to work and decompress for a few days. I attended the conference to give an intro-level talk and workshop based on my own work getting up to speed with the MediaWiki API, and to meet more of the larger Wikimedia community. I also got the chance to meet technical contributors whom I’d previously only interacted with on IRC and the wikitech-l mailing list. It’s good to be able to put faces to usernames. I also chatted with Asaf Bartov, a contributor to Mediawiki::Gateway. Asaf confirmed my first impressions of the library’s scope and quality–a good check for my work. So, the talk! If you’re interested in the basics of web APIs (or MediaWiki’s in particular), my slides are available on Wikimedia Commons. Video for the talks will be up soon–see the WikiConference USA 2014 category for more photos. Sunday was the open space/unconference day. We started off with lightning talks (I talked about the Seattle Attic as a feminist hackerspace) and then I attended Sumana’s Diversity/Ally Skills training, using the Ada Initiative’s publicly licensed materials. We had about an hour until the next round of lightning talks (very cool stuff: Book scanners! Publicly available Israeli laws! 5-shot method of shooting video! Gender visualizations! 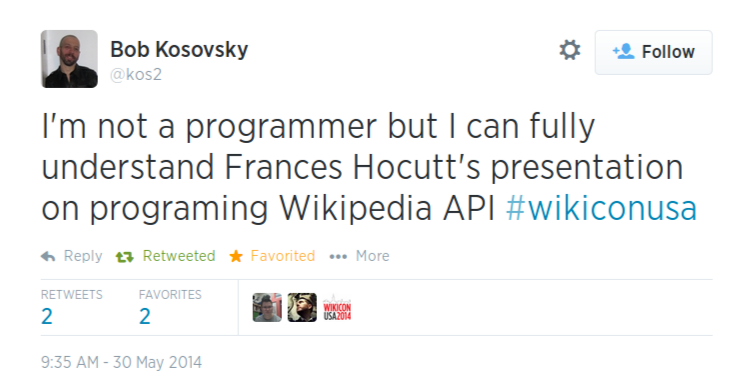 Wikidata and maps!) so we only got through a couple of scenarios. The attendees at the Ally Skills training had wanted to keep going, so I agreed to lead another session in the afternoon. It was an interesting experience, and it sounded like many of the attendees got a lot out of it. It was surprisingly/not surprisingly emotionally draining to run but I was glad to be able to offer this. The workshop offers concrete suggestions about how to deal with sexist words and actions as they come up, as well as some basic feminist background for people who may never have considered how some of these principles apply to their own life, and does it in the format of private small-group discussions. I am grateful to everyone who participated, shared, and listened in both of the sessions yesterday. I suspect that those conversations gave many of us things to think about. They certainly did to me.